Leaving Porthleven trek across the impressive 2.5 miles of Porthleven Sands to reach the unique Loe Bar where Cornwall’s largest natural lake (Loe Pool) sits separated from the ocean by only a narrow shingle bar. With water on both sides a bizarre sight said to have been formed when the giant Tregeagle dropped some sand from a sack he was carrying along the shore, damming the steam to form the lake. Loe Pool makes an outstanding inland diversion in great contrast to the scenery on the Cornwall Coast Path. Protected as a Site of Special Scientific Interest, the National trust maintain an fascinating 5 mile inland trail circling the lake taking in viewing hides over marshland which holds a notable array of birdlife amid patches of tropical looking willow and alder swamp. On route pass through the impressive estate, grounds and woodland drives of Penrose House along with the stunning remote and idyllic Carminowe Creek. A place of legend its claimed that this is the spot where King Arthurs Excalibur was returned to its watery home in a lake that takes a victim every seven years…. maybe....but we thinks it’s worth the risk!. It’s easy to build in a circuit of this impressive water to your days walk finishing in Mullion rather than Lizard Town - just let us know ! After tacking Halzephron (or Hells) Cliffs pass through a succession of striking coves to reach the 15th C Gunwalloe Church virtually on the beach with its odd detached bell tower cut into the cliffs and usually half-buried in the very fine blown sand. 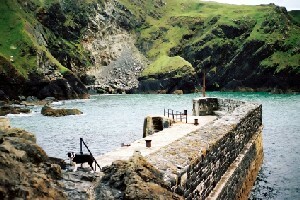 A Spanish boat laden with silver dollars was wrecked here and has so far resisted various attempts to bring up the treasure to what is now known as Dollar Cove. At Poldhu Cove “black pool” the route passes the Marconi Monument a lonely obelisk celebrating the first transatlantic telegraph signals made from this spot. 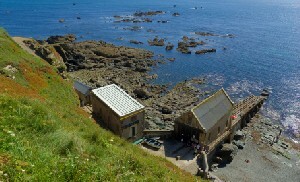 A Steep descent passing the old canon to Mullion Cove reveals a dramatic fishing hamlet seemingly hewn out of the cliffs. Enter areas of Serpentine now, the marble like red and green veined rock named after its resemblance to Snake Skin when wet and present throughout the craggy precipitous cliffs that now surrounds your walking. Exmoor Ponies, fulmar and Kittiwake look on as you climb and drop passing The Rill where the Spanish armada was first sighted in 1588, fires lit from here saved the nation by alerting Drake in Plymouth to the 120 ships heading his way. Arriving at Kynance Cove you discover one of the most spectacular places in the UK. A mesmerising mix of beach and rock its white Sands and turquoise waters meet in a network of sea caves, arches and blowholes shadowed by the giant Pillar of Steeple Rock and encased by sheer 200 ft serpentine cliffs high above the seething waters. Take it all in from the National Trust Cafe on the cliffs. At Pistil meadow a waterfall cascades over the cliff edge at a point where you can still make out the mounds of 200 drowned sailors buried in a mass grave in the meadow on the valley floor. There were only 3 survivors. You end the day staring out to sea having reached Lizard Point - mainland Britain’s most southerly bit of land the turning point for one of the busiest shipping lanes in the world and your signal to head inland to Lizard Town.